Against all odds, Wales will take their place at a major international tournament again for the first time since 1958 after reaching a historical classification to play the coming Euro 2016. Chris Coleman is the first Wales manager since Jimmy Murphy to lead his team to a major tournament and Gareth Bale has been the best Welsh player leading the national team with six goals in this qualifying round. Tomorrow Wales will compete against Ukraine in a friendly match to get ready for the Euro 2016 fixtures. Betfair wants you to enjoy this exciting match between two national teams that hope to play an important role in France next summer. 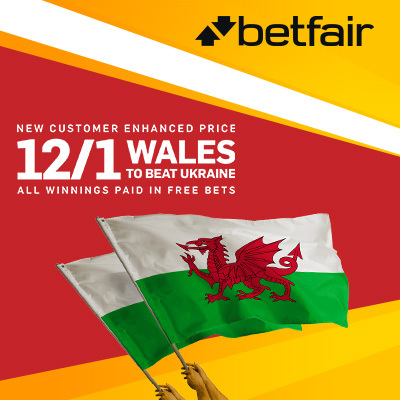 Thus, it offers an insuperable odd of 12/1 to bet on Wales to win! Are you interested? If you do, keep reading. Open a new Betfair account using the promo code ZFBCAG – only one account per customer. But also there is more! For every 5 x £10 bets placed and settled, you will receive a £20 free bet (£100 max bonus in free bets). You will also receive up to £/€10 as a free bet if your bet loses. And if your bet is succesful Betfair will payout your winnings enterely in free bets within 24 hours! Enjoy this amazing match and make money with this Betfair promotion!